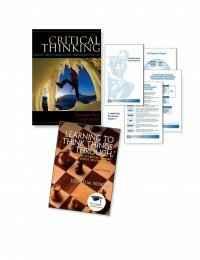 In addition to the College/University Faculty Thinker’s Guide Set, we recommend this bundle for helping college and university faculty learn the foundations of critical thinking and to foster them on a daily basis in the classroom. The text, Critical Thinking: Tools for Taking Charge of Your Learning and Your Life and Learning to Think Things Through: A Guide to Critical Thinking Across the Curriculum are designed for use with college level students. Critical Thinking: How to Prepare Students for a Rapidly Changing World is Richard Paul’s seminal work on critical thinking. 02BUND College and University Faculty Bundle $127.95	 Qty.